British Rail and their successors were always good at reusing surplus assets for new purposes with varying levels of conversion and success. Some of these conversions are the subject of our third expansion for Train Simulator 2014 completing the HEA hopper story. 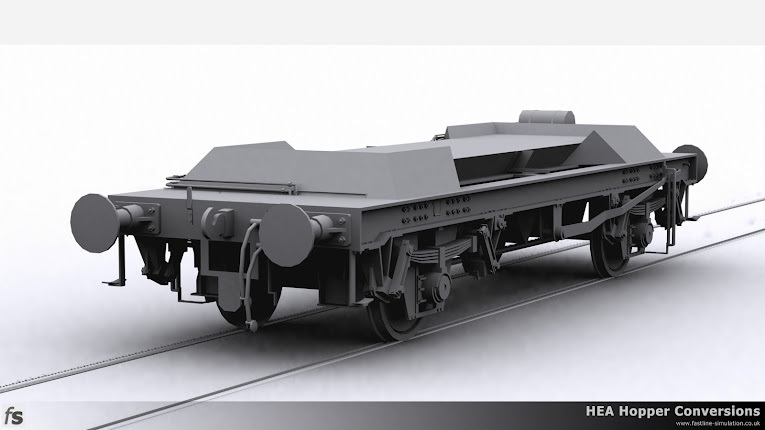 The research for the initial versions of the HEA hoppers uncovered the huge variation of wagon types that have been created through various conversions. Some of the conversions were basic, while others were more involved, completely changing the original appearance of the hoppers. CEA - Hopper fitted with flexible cover. MEA - Mineral wagon with high ribbed body. RNA - Recoded hopper and with hopper removed. As with all Fastline Simulation expansions for Train Simulator 2014, the models will feature a range of suitable liveries, loads, physics and tail lamps. There may even be a bonus item lurking in there!